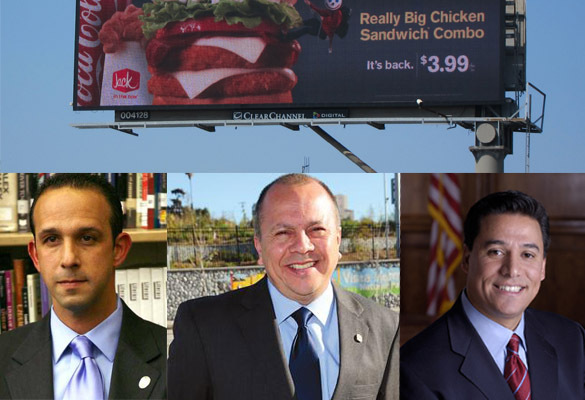 On Jan. 22, 2009, the president of the L.A. City Planning Commission gaveled to order a meeting in which the major agenda item was an extensive revision of the ordinance regulating billboards and other forms of outdoor advertising in the city. On Dec. 4, 2012, after numerous public meetings and further revisions by city planners, that ordinance was before members of the City Council’s Planning and Land Use Management committee, fully vetted by the City Attorney’s office and ready to be voted upon. It’s also easy to imagine that those same lobbyists have already worked out the nuts and bolts of a deal, right down to the proper legal language. Although details haven’t been made public, it’s clear that the centerpiece of an agreement with the city to “re-permit” the 100 digital billboards now operating would be an unspecified amount of money flowing from the billboard companies to the city’s treasury. It would surely mean more digital billboards as well, since the city would have to extend the very lucrative privelege to have digital billboards to companies other than Clear Channel and CBS Outdoor, which own all the digital billboards now in operation. -Limiting off-site digital signage such as billboards to special sign districts, where they can be strictly regulated to avoid negative affects on residential neighborhoods and traffic. These sign districts would be limited to intensive commercial areas such as large shopping and entertainment centers, thus precluding digital billboards from appearing on regular commercial streets. -Prohibiting signage such as large supergraphic banners and wall and fence wraps advertising commercial products and services in city parks and recreation areas. -Increasing penalties for maintaining illegal signs to a level that can serve as a real deterrant to companies tempted by large profits to cover buildings with supergraphic signs or maintain billboards that were put up or altered without permits. -Requiring new off-site signage in sign districts to be offset by the removal of existing billboards from the surrounding communities, thus reducing neighborhood blight.